5 Questions About: Strangers in the Wild Place: Refugees, Americans, and a German Town, 1945-1952. We’ve asked authors of books that were reviewed in the Oral History Review to answer 5 questions about why we should read them. In our latest installment of the series, Adam Seipp discusses his Strangers in the Wild Place: Refugees, Americans, and a German Town, 1945-1952. Read the review by Joyce E Bromley in OHR. What’s it about and why does it matter? My book is a small and focused study of a very big problem. At its core, the book is a history of small German town, Wildflecken, that became one of the biggest refugee camps in postwar Europe, then spent four decades as a US Army training area. However, my intention was to tell a larger story. Germany after 1945 was flooded with refugees, but each group of refugees ended up the responsibility of different agencies, governments, and organizations, including the US Army. If we study these refugee groups in isolation, using only archival material from different bureaucratic entities charged with refugee management, we get the sense that refugees were living on islands, cut off from others. In fact, the experience on the ground in Germany was very different. Refugees, German communities, and occupiers lived entangled lives. This requires us to write entangled histories. 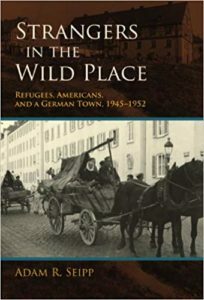 Strangers in the Wild Place: Refugees, Americans, and a German Town, 1945-1952. By Adam R. Seipp. Bloomington: Indiana University Press, 2013. 231 pp. Hardcover. Oral history gave me an opportunity to capture voices that simply aren’t represented in the archival record. I was writing about a small, rural community. When I got to the town at the center of my book, Wildflecken, I found a community that really wanted to tell its story. Almost everyone I met had experienced the history that I wanted to write about, either as an eyewitness or through their family. What do you like about using oral history as a methodology? My interest in oral history connected me to this community and to the global diaspora of individuals and families who passed through Wildflecken. One of my favorite oral history contributions to the book came entirely serendipitously, when I met the new fiancé (now wife) of one of my best friends from childhood. When I briefly explained what I did in my professional life, she suddenly said “My grandparents were married in that camp!” Her grandmother ended up giving me some very powerful material on ordinary life in the camp that helped me to move beyond the camp’s written records. Why will fellow oral historians be interested in your book? I had to learn a great deal about oral history for this project. My previous work focused on the early 20th century, so there was no possibility of conducting interviews. Refugee history has become such an important topic in recent years, and I hope that my work can contribute to that ongoing conversation. I tried, in my own way, to offer a narrative that moves beyond studying refugees as refugees and that examines the many points of connection between refugees, state agencies, non-governmental organizations, and the communities in which refugees found themselves. What is the one thing that you most want readers to remember about the book? The first sentence of the book is “This is an international history of a very small place.” Many of the reviews and reader responses have keyed in on that line – and I’m glad that they did. It sums up my approach, my goal, and the way that I try to conceptualize the fascinating messiness of post-war German history.